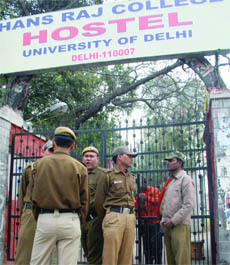 Hans Raj College remained closed today after the body of a visually challenged student was found hanging in his hostel room. Mukesh Kumar (23), who was pursuing Hindi honours from the college, was found hanging from the ceiling fan in room number 143 last night. His hands were tied in front. The demand for students’ union election in Jawaharlal Nehru University (JNU) suffered a setback yesterday after maximum students refused to go against the Supreme Court’s ban on it. The south district police has arrested three Nigerian nationals for cheating a Delhi-based real estate businessman out of Rs 1 lakh. Chief Minister Sheila Dikshit today launched the sale of 10 kinds of pulses from a Mother Dairy booth near Patparganj in east Delhi. An exhibition on women entrepreneurs, an attempt to bring traditional and ethnic works of nondescript women, will be held for the first time in the Capital after being an annual feature in Mumbai for 17 years. Chill might return to the Capital as the weatherman has predicted rains for tomorrow. Delhiites witnessed a cloudy and misty day today. Terming the Delhi government's licensing policy as arbitrary, the Delhi High Court today ruled that cycle rickshaws can ply in the national capital without any restriction on their number. Around 15 years back in 1994, five men got involved in a criminal conspiracy by installing two MTNL telephone numbers at Batla house of Jamia Nagar with ISD and STD facilities under fake names and papers. Indira Gandhi National Open University (IGNOU) today launched six FM radio stations on education. These will be in addition to the 31 radio stations the university already has. The Ghaziabad police has arrested a 70-year-old NRI hotelier from Goa in a case of cheating. The hotelier settled in the UK had reportedly failed to return Rs 6.5 crore that he had secured as a loan from a Ghaziabad financier. A man, suspected to be handling finances of Manipur-based extremist outfit People for United Liberation Front (PULF) and wanted in Manipur in four cases, was today arrested by the special cell of Delhi police this afternoon. Six bike-borne unidentified men allegedly robbed two employees of a security agency of Rs 4.5 lakh at gunpoint last evening in Sector-68 here. Dr Darshan Kaur, employed with Dr Munjal’s Clinic and Maternity Centre (MCMC), was arrested today by the Delhi Police (North) for allegedly forging registration documents. Angry farmers from three villages in Dadri— Satarpur, Kachera and Bisada— stopped the pipe-laying work of the Indian Oil Corporation yesterday due to delay in the payment of land compensation. A 55-year-old lawyer who used to practise at Karkardooma Court in east Delhi was found dead near the court premises around 10:15 pm yesterday. Hans Raj College remained closed today after the body of a visually challenged student was found hanging in his hostel room. Mukesh Kumar (23), who was pursuing Hindi honours from the college, was found hanging from the ceiling fan in room number 143 last night. His hands were tied in front. The police believes that the accused tried to pass it off as a suicide case. A murder case has been registered at Maurice Nagar police station. Kumar's family members reached the Capital today from Agra in Uttar Pradesh. Kumar's postmortem examination will be carried out tomorrow by a medical board. "A panel of doctors for the board was finalised today. The exact cause of death would be known only after we receive the medical report. We have questioned some people close to Kumar," said Sagar Preet Hooda, DCP (north). When asked whether the police had got any clue in the matter, Hooda dismissed it saying that it was too early to speak about it. However, a police official said that the police had questioned at least two persons, including a female friend of Kumar. They were called to the police station. "They are not suspects but they were questioned as they were close to the deceased," said the official. The college comes under Delhi University. The college administration called a hostel committee meeting today to look into the tragedy. In last night’s Urgent General Body Meeting (UGBM), a resolution put up by All India Students’ Association (AISA) which rules JNU Students’ Union (JNUSU), was passed by maximum students, giving way to the initiation of JNU Students’ Union (JNUSU) election. However, a writ petition would also be filed in the Supreme Court challenging the ban, at the same time. The apex court had put a ban on the JNUSU elections in October 2008 on the basis that the elections flouted Lyngdoh Committee’s guidelines. The matter was also addressed in the JNU court today which has more than 100 members, including six MPs who meet once a year to discuss issues related to the university. Some members of Parliament advised that court members should also ensure that the stay on JNUSU elections was lifted. A campaign for holding the elections within the first academic semester, initiated by the main opposition Students’ Federation of India (SFI) on January 20 this year, could not win over a majority of students and was defeated by 83 votes. According to the resolution passed with 749 votes, the present JNUSU led by AISA would constitute an election committee within the next two weeks to hold JNUSU elections. Though to avoid punishment under contempt of court, the students decided to consult legal experts and file a writ petition against the ban imposed on the elections in the Supreme Court at the same time. “We would start holding GBM in the schools where reports of councillors would be placed, marking the first step to convening the elections,” said Shephalika, vice-president, JNUSU. She said a meeting of the Joint Struggle Committee, an organisation of students formulated to fight the ban on legal level, would be called in the next two days to look into the legal complications of holding elections. On the other hand, all other students’ organizations, including the ultra-left Democratic Students’ Union (DSU), have questioned AISA’s intention of holding the elections. “Their stand is self-contradicting. If they want to look into the legality of the case, then it is clear that they would not hold elections till they get permission to do so,” said Banojyotsana, from DSU, adding that the beginning of the process does not make sense in that case. The organisation also asked why the AISA office-bearers of JNUSU had not filed the writ petition so far. The case was transferred to constitutional bench in November 2009 after which the JNUSU has not challenged it. The accused have been identified as Daniel (35), Goldstime Ozemoya (30) and Jude Ufuoma (33). They were arrested from near Saket PVR yesterday evening where they had come to collect Rs 1 lakh more from the businessman. The sum of Rs 1 lakh, which had earlier been taken by them from the complainant, was also recovered from their possession. According to police, the Nigerians started visiting the real estate businessman Aman Garg’s office for the past one week and desired to invest Rs 1 crore in realty. They said that they could pay in the American currency. “The businessman insisted on getting money in the Indian currency, but the cheats told him that they had crores of American dollars which they had brought to India secretly, concealing from the authorities,” said HGS Dhaliwal, DCP (south). “They further told him that they had to convert the dollars into black colour and those dollars could again be washed with the help of a chemical which they would have to procure from their Bombay-based agent and for this purpose they required Rs 2 lakh,” the deputy commissioner of police said. After much persuasion, Garg agreed to pay Rs 1 lakh after the Nigerians gave him a suitcase full of ‘black dollars’ as guarantee. However, after a relative told Garg to check the dollars, he realized that they were actually black papers cut in dollar size. The matter was reported to the Saket police station, and when the businessman called the trio to collect another Rs 1 lakh next day, they were arrested. During interrogation, the accused disclosed that they had come to India in December 2009 and came in touch with one Davis, a Nigerian national who persuaded them to make money this way. “Davis is presently based in Bombay and they do not have any idea of his whereabouts. They further disclosed that Davis had provided them with the seized black dollars and guided them how to dupe people,” said the officer. Further investigation in the matter is on. Speaking at the launch, she said that the weights and measure department of the government would start a massive campaign to check whether pulses and other food items were being sold at actual rates in retail shops. “The Delhi government would take strict action against hoarders and those shopkeepers found selling pulses and other food items in varying rates compared to the government rates,” she said. In the last six months, the Chief Minister said, Delhi has witnessed unexpected rise in prices of various commodities particularly basic food items like sugar, pulses, wheat, rice and vegetables. “It has been reported that the inflationary trend in food items has been to the extent of 20% over the last year and in spite of increased arrivals after the new crop has been harvested, the prices of pulses, sugar and vegetables have not lowered,” she said. The wholesale price of sugar continues to hover around Rs 4,200 per quintal and the retail rate has touched Rs 47-50 per kg. Similarly, the wholesale price of Arhar dal touched Rs 6,875 per quintal in January and retail price remained Rs 80-88 per kg. The retail price of Moong dal, Urad and Masoor dal has remained at a high of Rs 80-90 per kg. However, she said that after the government’s initiative to sell pulses and fortified atta, the price of these items became 15-20% less in the open market. The Chief Minister added that NAFED would soon start selling sugar at lower rate. The two-day exhibition starts on February 23. It will showcase exquisite collection of traditional Indian wear, including Patan, Pathani, Banarasi, Kanchipuram, Chanderi, Maheshwari and Phulkari. Some other designers and artistes would unveil their range in home, lifestyle and fashion categories. The proceeds of this exhibition will be used for a charitable cause to help women and children. “Women Entrepreneurs 2010 focuses on the revival of heritage textiles, saris and embroideries, which provides employment to women. We are promoting heritage textiles. In particular, we have included weavers from Nagaland and Assam to showcase their rich culture. We hope it will provide them a platform in local and foreign markets,” said Swati Piramal, president, ASSOCHAM and director, Piramal Group. Former Indian cricket team captain and MP Mohammad Azharuddin’s wife Sangeeta Bijlani, who will also lend a hand to the event, said there was a lot of talent in rural India which was not tapped. The minimum temperature today settled at 12.6 degrees Celsius, three notches above average, although lower than yesterday’s minimum of 15 degrees Celsius. The maximum temperature today was recorded at 22.3 degrees Celsius, a notch below the average. A full Bench headed by Chief Justice A P Shah quashed MCD's policy of not allowing more than 99,000 ricksaws to ply on the roads. "The right of an individual or citizen to ply cycle rickshaw or other forms of transport falls within the legitimate exercise of his freedom guaranteed under the Fundamental Rights of the Constitution," said the Bench which included Justices S Ravindra Bhatt and S Muralidhar. "It is held that the limit of 99,000 placed on the number of licenses which can be issued by MCD is arbitrary and hereby set aside," the court said adding there was no objective material which could "remotely justify" the cap. The court said there should be provision for parking of cycle rickshaws and the authorities should ensure that the rickshaw pliers and licensees "are not harassed." It directed the Delhi government, the Municipal Corporation (MCD), the Delhi Development Authority and the Delhi Police to constitute within a six weeks a special task force to explore all questions pertaining to road traffic in Delhi, including provision of separate tracks for rickshaws on roads. The task force would also go into the issues of minimising congestion, reducing pollution levels of motor vehicles and ensuring "equitable access to all classes of vehicles," including non-motorised transport such as bicycles and cycle rickshaws. The court's order has come on petitions filed by NGOs, Manushi Sangthan, Delhi, and the Initiative for Transportation and Development Programmes. One of them being an MTNL employee himself helped the others to get the connection. In this case, a Delhi court today convicted all five accused under various Sections of the Indian Penal Code, Prevention of Corruption Act and the Indian Telegraph Act. Special Judge V K Maheshwari convicted Fahim Ahmed Abbassi, Ashok Kumar, Mehmood and Jharkandi Rai (MTNL employee) to two years of rigorous imprisonment and slapped on them a fine of Rs 50,000 each. The magistrate, however, sentenced Shabban, a co-accused to one year of imprisonment and slapped a fine of Rs 10,000 on him. “Corruption is a scourge that not only severely affects the progress and development in the society but also poses a grave challenge to governance itself. Anti-corruption measures in India are perceived by the people to be weak and ineffective. More, than corruption itself it is the widespread public perception that corruption is not or would not be punished,” the court said while pronouncing the judgment. During the course of surprise check in 1994, two telephone numbers were found installed at Batla house with ISD and STD facility in the name of Ayub Ali and Mohommad Irfan. At that time, two men Ashok and Mehmood were found providing STD and ISD facilities to various parties at cheap rates causing subsequent loss to MTNL at the direction of Fahim Ahmed. As per the office records of MTNL, these two numbers were opened in 1994 by Okhla telephone exchange on the deposition of Rs 30,000 for each in ‘Tatkal category’. Later, Shabban obtained ISD and STD facility on September 27, 1994. Thereby, with an intention to cheat MTNL by way of evading payments, they started misusing the same. The non-payment of bills in respect to the two numbers from the year 1991 to 1995 was around Rs 40,00,000. The new stations, launched by minister of state for information and broadcasting Mohan Jatua, will be operational in Agra, Chandigarh, Jalandhar, Srinagar, Trichy and Thiruvanathapuram. Gyan Vani, as the FM radio stations are called, aim to enhance and supplement the teaching-learning process by reaching across to learners through a low-cost, popular mass medium using interactive formats. The first of the Gyan Vani stations was launched in 2001. IGNOU also celebrated a decade of the launch of its educational TV channel Gyan Darshan today. A collaborative effort of IGNOU, Prasar Bharati, ministry of human resource development and ministry of information and broadcasting, Gyan Darshan is a bouquet of four channels on vocational and technical education, higher education and sustainable development. Harbhajan Singh Chopra was arrested by the police from a leading hotel in Goa and is being brought to Indirapuram on transit remand, said Rajesh Diwedi, SHO. According to Diwedi, financier A.K. Jain had lodged an FIR in January stating that Chopra had taken Rs 6.5 crore about two years ago. However, the cheque issued by him bounced. Chopra is the co-owner of a leading three star hotel on Gurgaon-Mehrauli Road. "We found out that the cheque was issued from Corporation Bank account in Gurgaon. The account, belonging to his son, was closed several years ago," said Diwedi. According to police, Sheikh Sadik Hussain, alias Nazir (40), was caught from Hauz Rani following a tip-off. Hussain, a graduate from Imphal University, is said to be the finance secretary of the extremist outfit and had been staying in the Capital with his family for the last two years. “One of his sisters is a nurse in a city hospital while the other teaches in an engineering college in Faridabad. Hussain claimed that he was running a business here. He also claimed that he got a tender from Manipur on some educational activities,” said police source. His claims are being verified. The victims work with Om Security Agency in Sector-63. Om Security Agency in the only agency from Noida that has been chosen for security duty during the Commonwealth Games. Six armed men on three bikes allegedly looted the amount from the agency’s accountant, Gaurav, and field officer, Sachan, when they were going for disbursement of salary to security guards. When they reached Sector-65, six men on three bikes started following them. The men then allegdely pushed their bikes and the two fell. They allegedly snatched the bags containing cash from Gaurav and Sachan at gunpoint and sped past. Gaurav and Sachan informed the police about the incident immediately. Police personnel from Sector-58 Kotwali reached the spot and started a search for the robbers. The police officers ordered vehicle checks, but they failed to trace the criminals. According to the police, the robbers had knowledge about the movement of Gaurav and Sachan as the company pays salary to its staff on the 10th of every month. The police suspects a connivance between a company employee and the bandits. Kaur had joined MCMC with the registration number 12225, which actually belongs to Dr Suresh Kumar and this came to light after the clinic sent the respective registration certificates to the DMC for verification last year on August 18. A case under Sections IPC 420 (cheating) and IPC 417 (forgery of genuine false documents) has been registered against Kaur at the Saria Rohilla Police Station. The pipe is being laid between Ghaziabad and NTPC Dadri. On the complaint of senior IOC officers, additional district magistrate (admin) O.P. Arya has asked the Dadri SDM Somya Srivastava to ensure that the work starts soon. Srivastava said that farmers has been invited for a talk. If they stall the work even after this, strong action would be taken against them, she said. Every now and then farmers stop work or delay different projects in G.B. Nagar district over land compensation issue. “The victim has been identified as Hansraj Pundis, a native of Ghaziabad. There was no visible injury on his body. He probably died due to excess consumption of alcohol. A whiskey bottle was found near the body. However the exact cause would be known only after we receive the postmortem report,” said a police official. Pundis’s watch and wallet were found intact.